She was terrified that the boat would capsize. It kept tipping toward one side, then the other. There were too many people on board—more than 40— all carrying bags with lifetimes of belongings that hardly fit on the small structure. She could barely move without touching another sweaty body beside her. She didn’t eat for 24 of the 36 hours on the boat journey escaping from Yemen. After four months in Djibouti, Abdullah moved to New York to reunite with her family at the end of 2015. She had spent much of her life in New York until she was 15, but moved to United States from Yemen when she was eight. She gained U.S. citizenship through her father, who had lived in the United States since the 1970s and worked as an electrician in New York. In 2011, after seven years in the United States, Abdullah returned to Yemen— she missed her Yemeni family dearly, she said. Both her mother’s and father’s sides of the family were still in the country. Nearly 7,000 miles away in New York, a teenage Abdullah noticed that her native Arabic was gradually slipping away from her. The words didn’t roll off her tongue as easily as they used to—losing her home language stung, she recounted, and she felt alienated from her cultural roots. Her mother and father stayed behind in New York, but her younger sister accompanied Abdullah to Yemen. Coincidentally, her arrival in Yemen corresponded directly with the birth of the Arab Spring. She arrived in the city of Taiz in southwestern Yemen in early 2011. She lived with her mother’s family members, most of whom were revolutionaries, Abdullah said. They protested the authoritarian government of then-president Ali Abdullah Saleh. Abdullah remembers watching as clashes between government and protesters became increasingly violent by March of 2011. “There were shooting sometimes, bombings,” Abdullah said without hesitation. “A bombing would hit the place where we were standing just five minutes ago.” From 2011-2015, the political conflict escalated, Abdullah said. Gunshots became indiscriminate. One by one, women became the sole caretakers of their households as their brothers, nephews and husbands were killed, injured and disappeared. “No one was off limits,” Abdullah said of the fighting. Once the Saudi-led coalition launched their intervention in 2015, the chaos only increased. Some of her cousins were shot dead in the street, Abdullah said. Her family would often huddle behind kitchen oven when, shaking, they felt the vibrations of bombs descending on the city, sometimes just one or two houses down from their own home. Abdullah saw the buildings around her collapse, demolished to shambles by bombings. The house where she used to live was flattened by airstrikes. “It’s just completely gone, there’s nothing there now,” she said. Saudi Arabia, along with nine other Middle Eastern and African countries, including the United Arab Emirates and Egypt, launched a war in 2015 meant to defeat the the Houthi rebels—who the Saudis charge are backed by Iran, Saudi Arabia’s regional rival. The Houthis ousted Saudi-backed President Abdrabbuh Mansur Hadi, Saleh’s successor, in early 2015. Trump has vowed to maintain arms deals with Saudi Arabia and to negotiate more of them in the future, despite the kingdom’s widely criticized human rights record—the latest evidence being the assassination of prominent Saudi journalist Jamal Khashoggi. The war in Yemen has also brought numerous allegations of human rights abuses against Saudi Arabia. The Saudi-led coalition is supported by the United States, which has provided the Saudis with fighter-jet refueling and sold about $112 billion worth of weapons to the kingdom during the Obama administration, according to the Brookings Institution. Though the Trump administration has vowed to maintain arms deals with Saudi Arabia despite the devastation in Yemen, policy experts say that they haven’t seen the administration pushing these sales forward. In November of 2018, the Trump administration stopped refueling Saudi war-planes used in Yemen, said Kate Gould, the director of Middle East policy at the Friends Committee for National Legislation in Washington D.C. “This was a major win from last year,” said Gould of the United States’ decision to halt refueling. As Saudi Arabia’s U.S.-backed war rages on, Yemen has splintered: Houthi forces control the capital, Sanaʽa, and much of the west and northwest of the country. Saudi and Hadi-backed forces control parts of the western coast, and much of the central and south-east regions of the country. Al Qaeda also has a strong presence in south Yemen as what critics call a key Saudi ally, though Saudi officials deny any formal link. United States lawmakers and politicians have recently made moves to end U.S. collaboration in the war. On Wednesday, Feb. 13, the House of Representatives voted yes on a Senate resolution to terminate U.S. military assistance to the Saudi-led coalition in Yemen. It remains to be seen if this resolution will pass in the Republican-controlled Senate, as the Trump administration has stressed the importance of the U.S. alliance with the oil-rich kingdom. Momentum to stop U.S. involvement in the war has been building momentum greatly over the past couple of months, according to analysts. “There’s been so much constituent energy against it,” Gould said. “I’ve heard from congressional offices that they have been surprised to hear so much about Yemen.” Gould attributes the growing efforts to stop U.S. entanglement in the Yemen humanitarian crisis to various things—among them, images of 40 children killed by a U.S. bomb dropped by the Saudi-led coalition on a school bus in August of 2018, and the murder of Jamal Khashoggi in October of 2018. Critics have questioned the U.S. strategic interest in the Yemeni war, especially considering what they call Saudi’s de facto alliance with radical Sunni groups such as Al Qaeda. Yemen is a country of more than 29 million people and the poorest in the Arab world—wedged between Saudi Arabia and Oman, along the Red sea and the Gulf of Aden. It has been caught up in the wider geopolitical conflict between U.S.-backed Saudi Arabia and its regional rival, Iran. For Saudi Arabia, “minimizing civilian casualties was not part of the equation,” said Malley, who previously worked in the Obama administration as the White House coordinator for the Middle East, North Africa and the Gulf region, among other roles. Despite the growing U.S. pressure, it’s still a desperate situation for people looking to leave Yemen, Gould said. Saudi Arabia has blockaded ports, essential for the entry of humanitarian aid, medical and educational infrastructure has collapsed, and Yemenis looking to escape the conflict are placed in internally displaced persons and refugee camps with near uninhabitable living conditions. Since 2015, the violence has caused 3 million people to flee the country, there are 1.1 million people with cholera, and 53 percent of the population is close to starvation, according to the United Nations refugee agency. As of June of 2018, there are almost 300,000 Yemeni refugees and asylum seekers. Though Abdullah was able to escape the conflict, many of her family members weren’t so lucky. Two of Abdullah’s maternal uncles went missing when they went to survey the wreckage of a neighbor’s home hit by a Saudi bomb, she says. “They went, and we never heard of them ever again.” At the time, she was living in a village on the outskirts of Taiz, only a short drive from her uncle’s house. She remembers that day clearly. “My uncle was supposed to visit us the next day, but he never came,” she said. Her family immediately checked hospitals, burial sites, talked to eyewitnesses—no one knows where her uncles ended up. They are among the many missing in the country’s war, though data is thin on how many people exactly have disappeared in the span of the chaos. Both their wives were pregnant at the time, Abdullah said. They soon suffered miscarriages. Abdullah lived in Yemen for almost five years, most of them conflict-ridden. She had to stop going to school for two years as the education system in Taiz became another victim of indiscriminate bombings. Her aunt, a teacher, created a makeshift classroom in her house as school buildings were decimated by airstrikes. Abdullah and her sister were ushered out of their family home to a smaller place in the countryside as shootouts in Taiz became commonplace. For a time, Abdullah worked as a volunteer English teacher for elementary school students in one of the few schools that was still functioning near her village, she said. 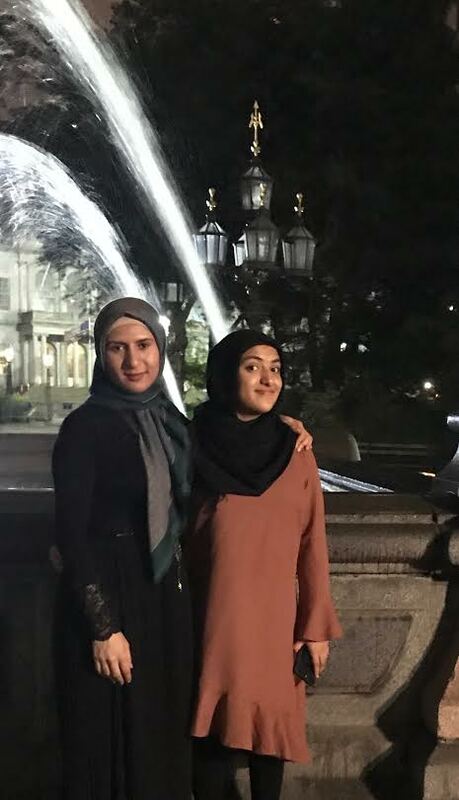 Abdullah and her sister’s U.S. passports expired while they were living in Yemen, and the U.S. consulate in Sana’a was not fully operating when they tried to renew them in 2014. 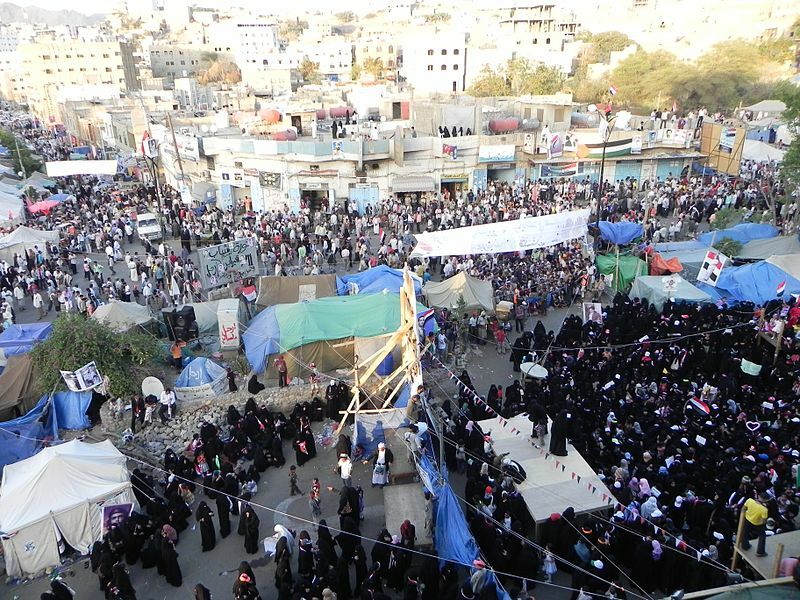 In 2015, the U.S. consulate in Sana’a shut down, eliminating any chance for the sisters to renew their passports in Yemen. “When I did want to come here [to the U.S.], I couldn’t, because the war broke out,” Abdullah said. “The war prevented us from coming back.” Abdullah and her sister were smuggled out of Yemen on a boat across the strait of Bab-el-Mandeb to Djibouti, a hub for Yemeni refugees. Many are stranded there for months and years in barren camps—the United Nations Refugee Agency estimated that from March of 2015 until the end of 2016, about 30,000 Yemeni refugees and migrants arrived in Djibouti. Most of the people on her boat descended at the refugee camp. But not her—American citizens continued to the capital city. “How can a piece of paper get me valued so much more?” she said of her U.S. citizenship status. The sisters had relatives in Djibouti city, where they stayed for four months until they were able to renew their passports at the U.S. consulate. She’s happy now in New York, she said. She is enrolled in International Studies and Political Science at the City University of New York with a focus on the Middle East. One day, she hopes to become a U.S. ambassador to Yemen. Here in New York, she says the Yemeni community is slightly fractured. Both the Houthis and the Saudi-backed coalition have committed atrocities in her country, she says, but most people, including herself, oppose Saudi Arabia’s involvement in the country. She tries to show her love for Yemen from afar in different ways. “We help our family in Yemen financially as much as we can,” Abdullah said. Despite the ongoing struggle in Yemen, she is constantly moved by how her relatives there remain optimistic and maintain a modicum of daily life—giggling on the phone, taking time out to attend family gatherings, weddings and other events. Now, she says, her family lives in mostly Houthi-controlled areas near Taiz that are known to be slightly safer than other parts of Yemen. But for a while it was open warfare between the Houthis and the Saudi-led coalition, Abdullah said. “They were just bombing everywhere randomly,” she said. Abdullah’s brother, also a U.S. citizen, is traveling to Yemen to get married this year; her mother is going with him. She’s nervous for them, she said, but she understands the desire to be close to the home country, despite the danger. But is she ready to go back?